EB08669 (3.8µg/ml) staining of paraffin embedded Human Cortex. Steamed antigen retrieval with citrate buffer pH 6, AP-staining. Peptide with sequence C-KKATSVQQIEMEES, from the C Terminus (near) of the protein sequence according to NP_001034679.2. 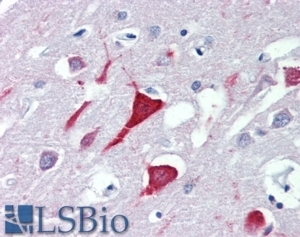 IHC: Immunohistochemistry: In paraffin embedded Human Cortex shows strong cellular body staining of neurons. Recommended concentration, 3-5µg/ml.